So, maybe I haven’t dyed my own fabric to make a dress from scratch this weekend, but I have been busy. I reworked my reworking of my drawing and created this painting. I should reassure the world that I come from a normal household and family. There was no cultish devil worship in my childhood, despite what the neighbors may think. It’s not my parents’ fault that this is what happens when I try to do happy and sweet. Yes, it is happy and sweet, but it’s… well, me. I’ve been thinking a lot about our beloved monsters… they are the big, scary things in our lives that protect us from other people. They can be addictions, behaviors, thoughts, fears, or any number of things. We are completely intimate and comfortable with our monsters, with the benefit of keeping other people at arm’s length. So… do we have, keep, and protect our monsters, or do they have, keep, and protect us? "Sam", the Word's Ugliest Dog, for three years running. I believe Sam passed on to the Rainbow Bridge in 2005, where he is hopefully much more attractive in his eternal form. I think it’s a credit to my disposition that my mind is not warped enough to create an uglier animal than Sam from my imagination, even though I tried very, very hard. 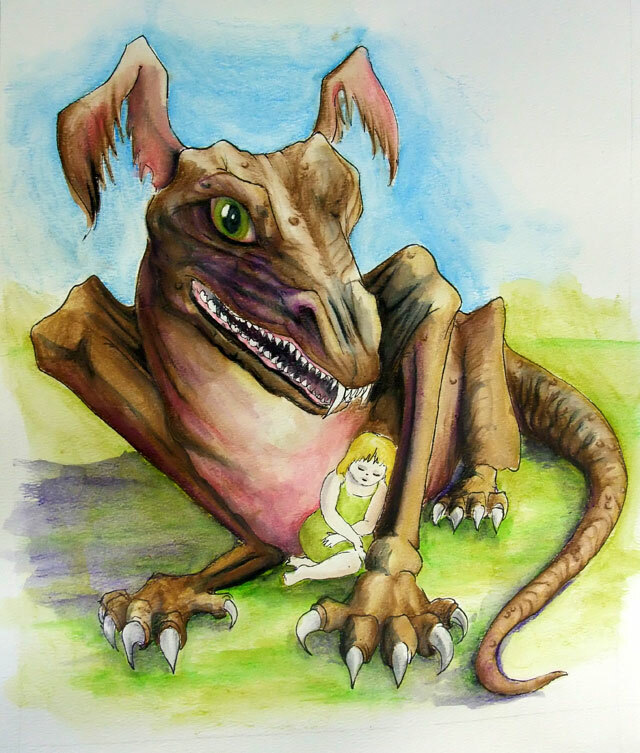 This entry was posted in creativity, painting, studio and tagged Arts, Drawing, drawing, mixed media, monster, monsters, painting, postaday2011, Sam, studio, Visual Arts, watercolor. Bookmark the permalink. I love your painting. Maybe if we acknowledge our monsters they can take on new meaning in our lives. Thank you so much for your kind comments, Lisa! Rebecca and I have been enjoying this process, and it’s just great to be able to share our work with others. I think your monster is rather sweet. I was never really convinced that the maiden didn’t want to be with the dragon. Are you suggesting that dying is a bit overboard? Ah, well, I won’t take it personally and it could still end in complete disaster 🙂 And I don’t really like the way the colors turned out anyway. That blue doesn’t work for me. PS: Right now I’m making my own bread from scratch WHILE I work on my dress (and I need your help). I really do like the colors. Dang it! SIGH. Really, I CAN spell.